The tiger is, on average, the largest of the big cats, with the African lion a close second. 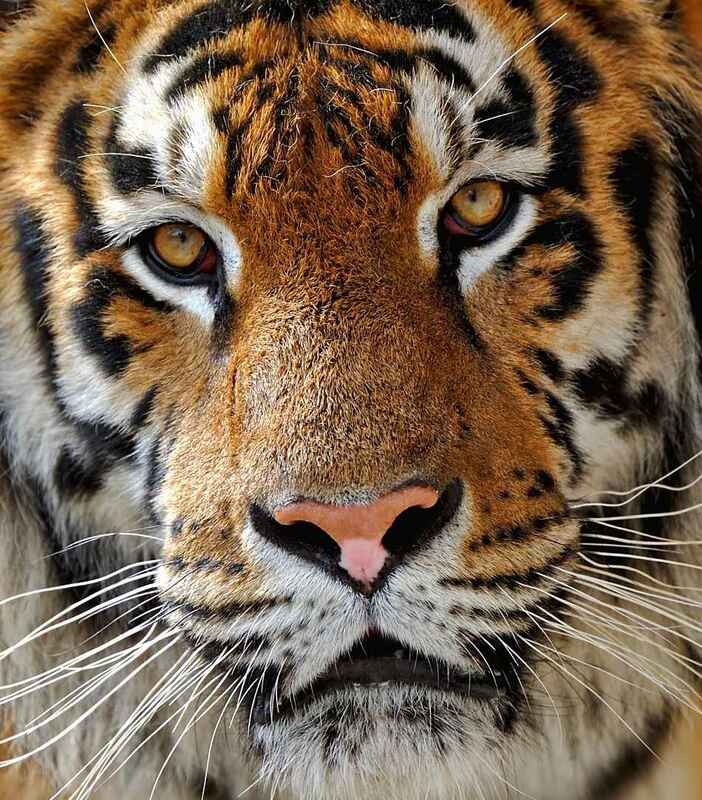 A mature Siberian tiger can top out at 11 feet long and close to 700 pounds. Tigers once inhabited most of Asia, from the tropical islands to Siberia. Today they are restricted to small patches of territory and very limited populations of each of the 6 living subspecies. The largest of the tigers, the Siberian or Amur tiger, lives in the coniferous forests of Russia where its thick fur and full neck ruff keep it warm in deep snow. In contrast, the much smaller Sumatran tiger lives in thick southern jungles and regularly bathes in ponds or streams to keep cool. The Bengal tiger is the most common of the subspecies. They are almost as large as Siberians with top weights in the 500 pound range. Bengal tigers live in India, Bangladesh and Nepal in semi-tropical jungles. The tiger is a stalk and ambush style hunter, and it's familiar stripes provide camouflage in thick underbrush as it waits for prey as large as 1000 pound water buffalo. They have the largest fangs in the animal world and are very swift killers. The tiger is basically a solitary animal with a typical feline lifestyle. They roam wide and have very large overlapping territories but conflict and aggression between individuals is rare, and amazingly, wild tigers have been known to share their kill with other individuals, not always family members, who may happen upon them feeding. This fascinating behavior, so different from the highly food-aggressive African lion, has been well documented. The tiger, (and particularly the Bengal due to its proximity to civilization) is responsible for more human deaths then any other cat, hence the common term "man-eating tiger". As the third largest carnivore on land, the tiger is smaller only than the polar bear and the brown bear. But Bengal tigers in particular eat some of the largest prey, including gaur antelope, sambar deer, and massive water buffalo over 1200 pounds. Tigers have been known to kill and eat sloth bears and Asian black bears, baby rhinos and even leopards. There have been isolated incidents reported of Bengal tigers taking down young elephants and even full grown infirmed adults. 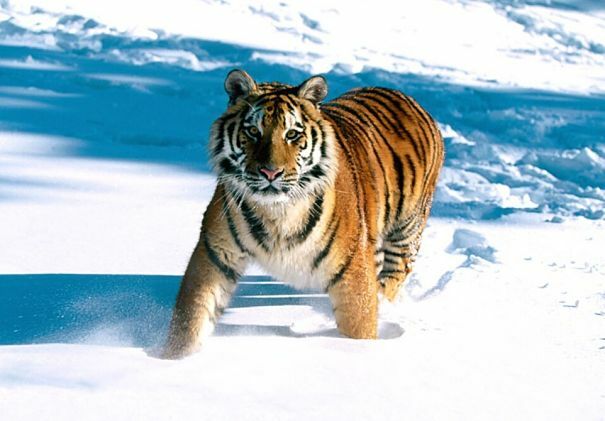 Siberian tigers - the largest of the tiger subspecies - actually prey on smaller game than the Bengal, with deer and mountain goats being their most common fare. The Bengal is also the most likely tiger to kill human beings because its range has been so severely impacted by advancing development. 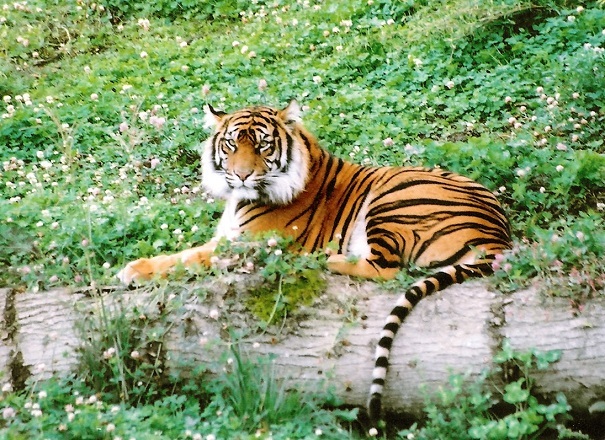 Most wild tiger subspecies do not intermingle, because their populations are separated by wide swaths of civilization, but captive individuals in zoos, preserves and private possession have been housed together, and have inter-bred for decades and are not usually pure representatives of any one subspecies. More often than not they are of mixed heritage, out crossed between the subspecies for so many generations of captivity that they are effectively "mutts". . 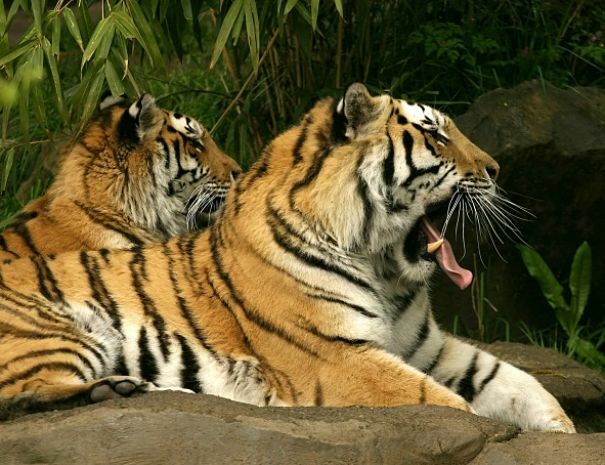 Male and female tigers will pair up when the female is in estrus. After mating numerous times over the course of 4 or 5 days the male will return to a basically solitary life. The female tigers pregnancy is 3 1/2 to 4 months long. In the last few days of pregnancy, the tigress will secure a safe nesting place because where she will deliver her 3 to 5 cubs. 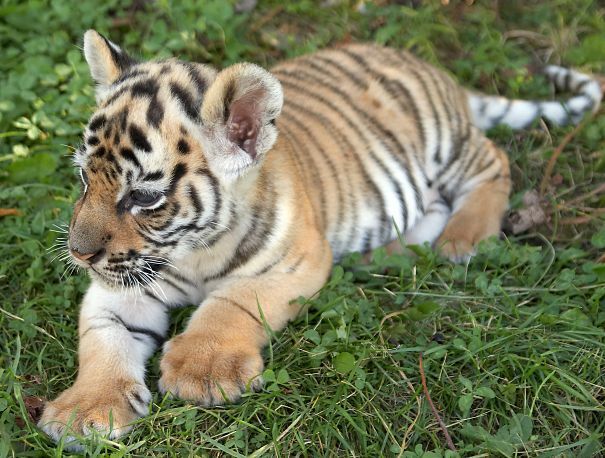 The newborn tiger cubs weigh only about 2 pounds, are blind, completely helpless, and fully striped. The mother only stays in the same nest for a day or two and moves her cubs from hiding place to hiding place one at a time for the first few months of their lives. This is a very dangerous time for the cubs, as she must leave them alone while she hunts. Often entire litters are lost when they are discovered by bears, leopards or snakes. Fathers do not take part in the rearing of the cubs, although they have been known, on rare occasions, to return to visit and rest nearby. Mother tigers begin to take their cubs on hunts when they are about 6 months old, but they won't be able to successfully hunt for themselves until they are about 2 years old. Once the tiger cubs are fairly efficient hunters, they begin to branch off from their family, slowly developing their own territory, which they will mark by clawing trees, spraying urine and leaving strategic droppings. Young females with their new litters will occasional visit with their mothers to show off the grandkids. 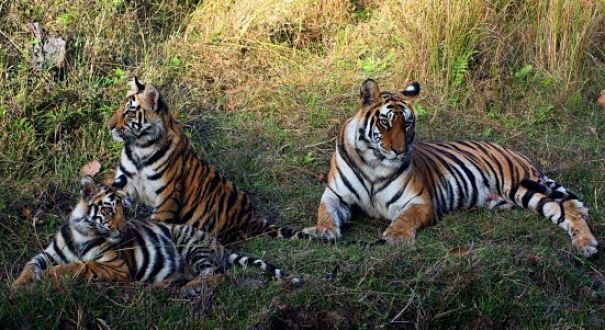 Alliances of adult females occur briefly, from time to time, but food of the size and quantity that tigers must have is scarce and requires that tigers spread out in order to survive. The depletion of large game animals throughout their native lands is the single factor in the endangered status of the tiger. Most of their habitat is compromised by human expansion and the undisturbed acres they need to survive are hard to come by. In a recent poll, the tiger was voted favorite animal in the world, beating out the humble domestic dog by one percentage point. The Siberian tiger and the Bengal tiger, with their impressive size, spectacular coloring, and breathtaking beauty, have captured peoples imaginations for thousands of years. Unfortunately, capturing some of the tigers magic is a human obsession, and potions, remedies and good luck charms made from almost every tiger body part are big business. Tiger blood, crushed bones, and entire paws or skulls are highly prized to this day, and even as every sub-species of tiger is endangered in the wild, illegal poaching still goes on to supply the trade. Fortunately for the survival of the species, many people still like their tigers alive, and while less than 5,000 tigers survive in the wild, there are at least 60,000 in captivity, with over 10,000 kept as personal pets in the United States alone. 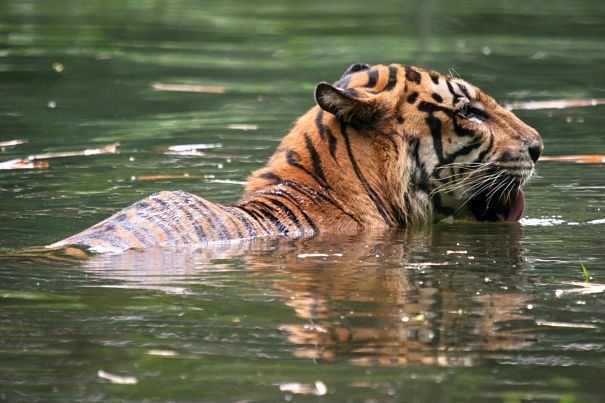 Unlike most other cats, tigers do not shun water, in fact, they regularly play, lounge and otherwise recreate in the ponds, lakes and rivers of hot Asian jungles, swimming not just to cool off but just for the fun of it. 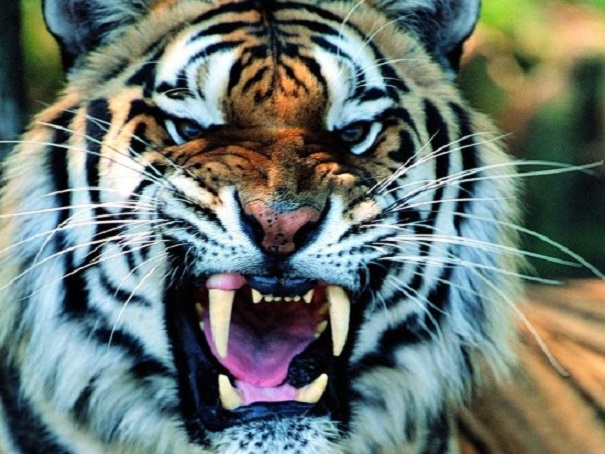 Tigers have the largest fangs in the animal kingdom, in fact, the longest Siberian tiger teeth on record were close to 5 inches long. That's nothing to snarl about! Another well equipped creature was the long extinct Saber-tooth tiger. The saber-tooth had fangs as long as 10 inches, theoretically to pierce the tough hides of woolly mammoths! The saber-tooth was not actually a tiger though, it was a bear-like creature called a smilodon. There is no evidence that the smilodon was striped, but we do know it had only a 9 inch tail. 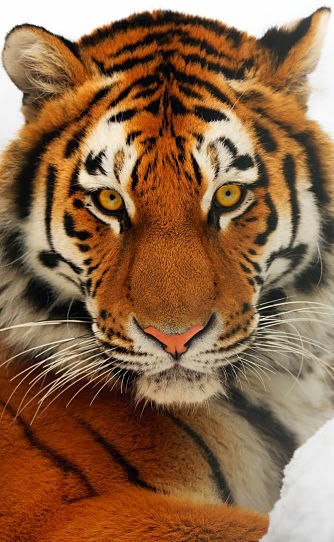 The Siberian tiger is also known as the Amur tiger. The tiger is the largest of the four "Big Cats"
Tigers love water! Playing, swimming and snoozing in it! 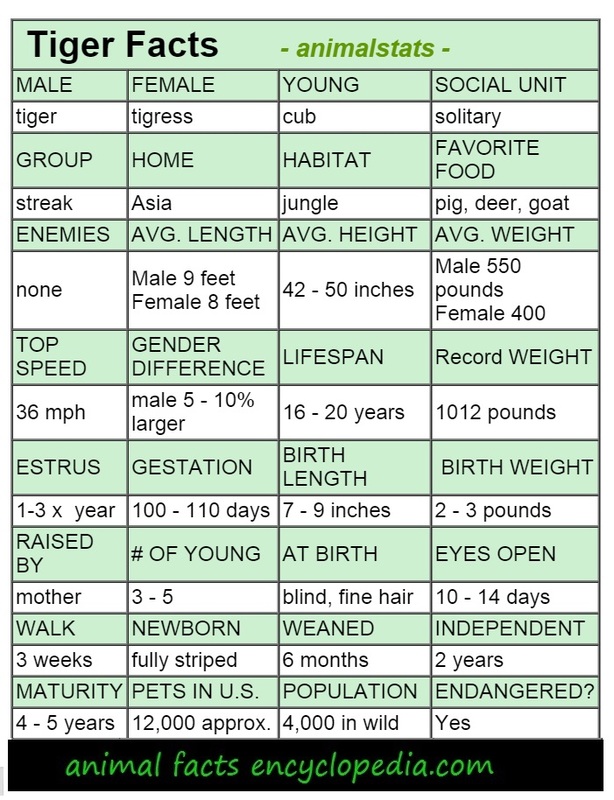 There are 3 times as many tigers kept as personal pets in the U.S. than exist in the wild. Tigers can eat 60 pounds of meat at one time. A group of tigers is called a "streak"
Tigers can be found both on tropical islands and in the snow covered wilderness of Siberia. MATURITY PETS IN U.S. POPULATION ENDANGERED?